(Francisco Kjolseth | The Salt Lake Tribune) Utah chef and UVU culinary instructor Todd Leonard, right, was named the 2018 national Chef of the Year by the American Culinary Federation. In this archive photo, he guides student Madeline Black during a 2017 school event. 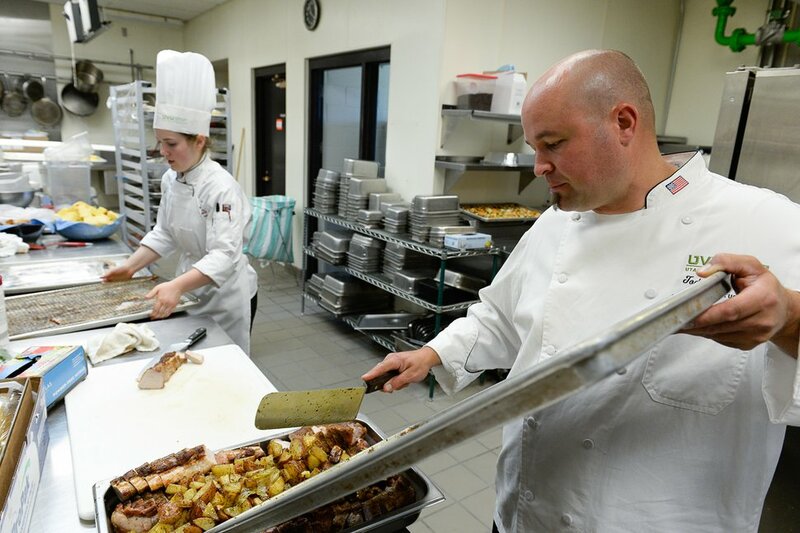 Utah chef and culinary instructor Todd Leonard tried seven years ago to capture the national Chef of the Year title, competing against three other regional chefs in a fast-paced, timed competition. This time, he came out on top. The 41-year-old emerged as the 2018 winner of the prestigious cooking competition, held during the American Culinary Federation’s convention in New Orleans. Leonard and his three competitors — who all had won regional competitions to qualify — had 60 minutes to create a four-course menu using oysters, pork cheeks and Louisiana redfish — a classic fish for blackening. During the competition, Leonard got help from two apprentices, AnnaLis Nielsen and Lydia Harris, both culinary arts students at Utah Valley University, where Leonard is the director of the Culinary Arts Institute. Leonard’s win is the first time since 1997 that a chef from the Western region has won the Chef of the Year award, ACF records show. But Utah has been well-represented in other ACF national competitions. Two of Leonard’s UVU students won the national Student Chef of the Year title — Michelle Stephenson in 2016 and Madeline Black in 2017. And, in 2012, Utah pastry chef Adalberto Diaz Labrada won the ACF’s National Pastry Chef of the Year. The award eventually helped Diaz launch his Salt Lake City bakery, Fillings & Emulsions. Leonard’s award comes at a busy time professionally. He just launched 15 new menu items at Blue Lemon, which was named among the Top 40 Fast Casuals to Watch by QSR Magazine in February 2017.